Back in the Philippines when I was in High School the only Taquitos I knew was this junk food from Jack n’ Jill, little that I know a real with that name food exists. Anyways fast forward 10 years in my life I was introduced to it in a small Mexican restaurant near our house and together with that this food item called taquito. Taquito, rolled taco or flauta is a Mexican food made up of a rolled-up tortilla filled with meats like beef, pork or chicken alongside other ingredients like cheese and chillies. This tortilla is then fried until crispy then served with sour cream, salsa and/or guacamole. This dish might have been invented in the early 1900’s but the earliest records pertaining to the name was when it was recognized in the Preliminary Glossary of New Mexico Spanish during 1917 where a small taco was named as a taquito. Since then the definition changed that is why in 1929 it was given a new meaning which describes the taquito we know today. Two Socal restaurants were credited for their roles in creating and making this dish popular. Cielito Lindo was the first one, it was founded by Aurora Guerrero in 1934 in Los Angeles and it was the recipe of Guerrero’s daughter where it all started. This recipe proved to be popular so they started to operate in multiple branches, it was then imitated by competitors making the dish even more popular. The other restaurant was the latter named El Indio Mexican Restaurant, they started to sell taquitos during the World War II when they were asked by the nearby Aircraft Company near their premises to make some lunch that is portable, then their version of taquito was born. A really nice and simple dish to prepare and also a good use for those left over roast meats, all you need are some leftover meat, tortillas and the common spices used in the Mexican Cuisine. In a large pan add oil then sauté garlic and onion. Add cumin, oregano and chili powder then cook for 30 more seconds or until fragrant. Add the pork, cheese, cilantro, jalapeno and lime juice then continue to cook until cheese melts. Turn heat off. Place 2 tablespoons of the pork and cheese mixture on each tortilla then roll tightly and place in a lightly greased baking tray seam side down. Bake in a 190C pre heated oven for 15 minutes or until tortillas are brown and crispy. Remove from oven then serve with Sour cream and tomato salsa. Gosh, i open this post on my clinic during the lunch break, i just finished my meals and i craving for some taquitos now!!! Oh, I would love these Raymund. Oh My Raymond, these little morsels do sound a treat. I like how you have specified to choose the fatty bits for the roast pork! Thumbs up! 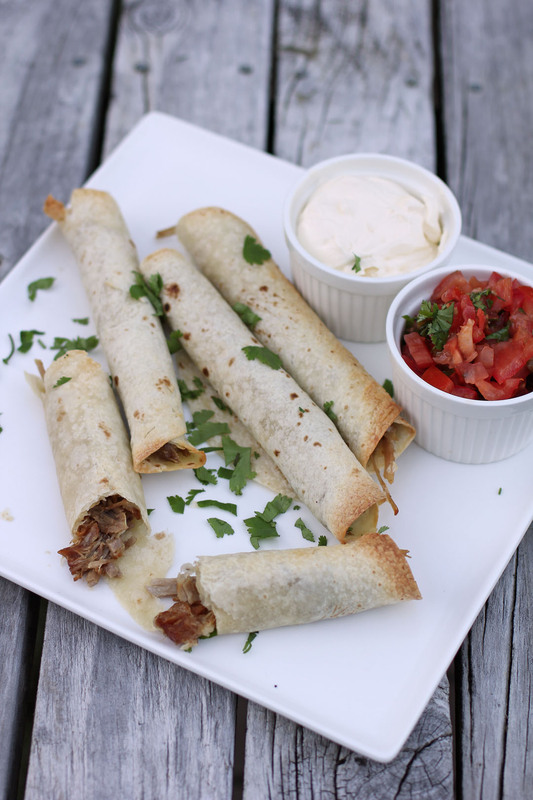 What a great and easy recipe for baked pork taquitos. My children are crazy for taquitos and these are healthier than the fried version. Tortilla wraps! My girl loves those – she likes Mexican. 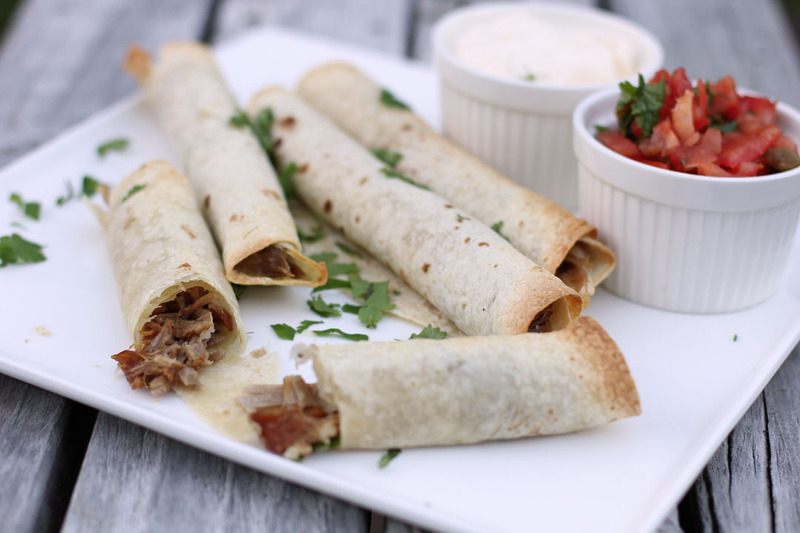 Your taquitos sure look good! Have a great week Raymund!